Nothing is more unappetizing than going to cook something and being assaulted with nasty smells. Because of its confined interior, the microwave tends to hold odors a long time, but you can combat the problem with a little know-how. It only requires a couple of items that are probably already sitting on your kitchen shelves. Keep your microwave odor free so the smell doesn't permeate other foods. Clean the microwave with soapy water to make sure all food particles are removed. If there is anything stuck on and difficult to remove, spray with a foam cleaner and let it sit for five minutes and then wipe clean. Fill a medium-sized bowl with water and pour in 1 cup of vinegar. Add several slices of lemon or squeeze lemon juice -- about 1/8 cup -- into the bowl. Turn the microwave on high and allow the water to come to a full boil. Let the water stand for about 15 minutes before opening the door. Repeat this once a month or once a week as needed. With a little care, your microwave should stay clean and sweet as long as you own it. 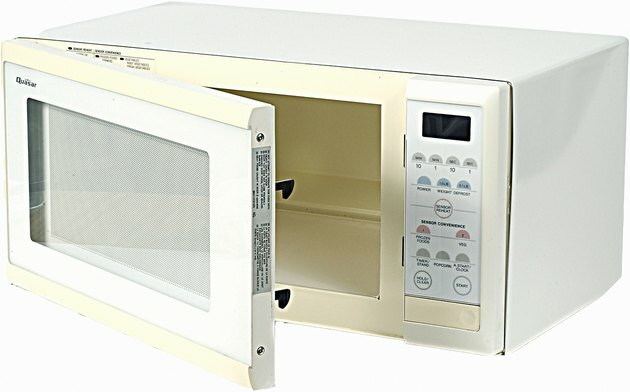 How Do I Clean a Stainless Steel Microwave Interior?